Here are the punches I use for modeling scrollwork. They are simply discarded Busch burs with a nearly flat face. If the face is too rounded, the punch isn't nearly as effective in pushing the metal where you want it. When you first look at the punch you'd probably think it's flat, but it's not. It has a very slight radius. I really like the hollow grind of the Bush burr shanks as they make it very easy to see the face of the punch when working. I'm sure there are many other types of steel that will work just as well, but for me, these feel and perform perfectly. 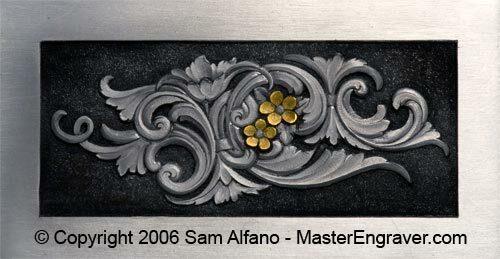 Per Phil Grifnee, I texture my punches to produce a darker finish than a brightly polished punch. I also think the textured punch is more efficient in moving metal. 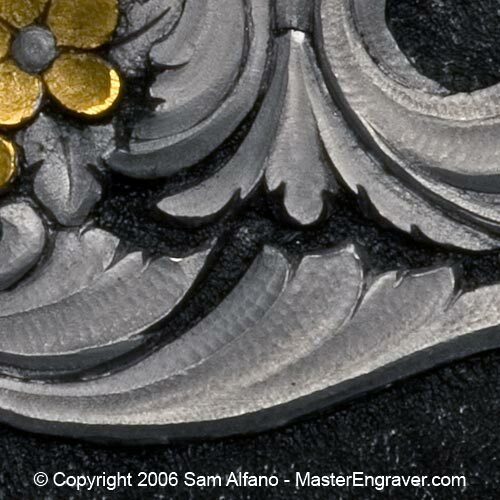 After relieving the background, the scrollwork above was shaped and modeled with the punches below. The majority of it was done with the largest punch, and the smaller ones used to shape tighter areas. To achieve the hammered look, I use stroke speeds of around 500 strokes per minute. I rather like the tooled finish produced by these tools. For hobo nickels I use the same punches, but also do a lot of carving with slightly rounded gravers. What are the diameters of the working part of the punches?